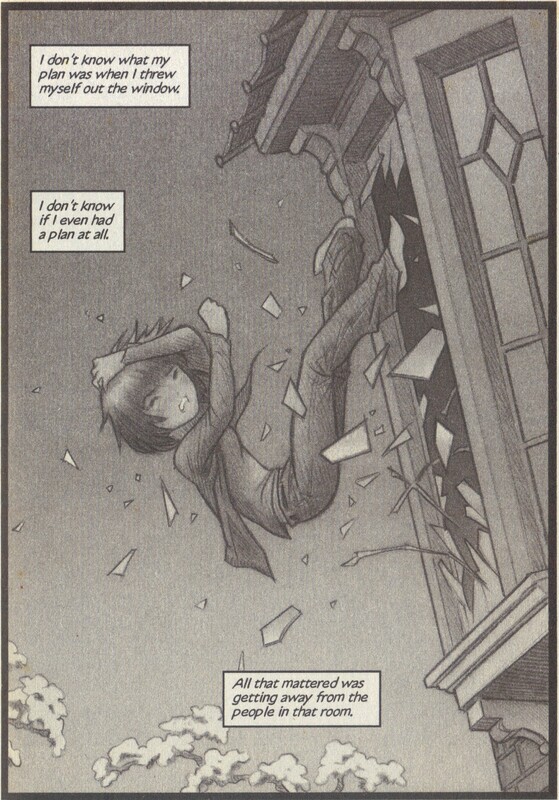 Recap : Miki breaks out of a house through a third floor window. She falls into the grass below and loses consciousness. As this happens, she begins thinking back to the events of the beginning of the year. Miki: I don’t know what my plan was […]. I don’t even know if I had a plan at all. All that mattered was getting away from the people in that room. And if that meant broken bones or a concussion…or something a whole lot worse…well…that was a risk I was willing to take. If asked to describe Mark Crilley’s graphic novel series Miki Falls in one sentence, it would have to be “Twilight in Japan”. While the truth is more complicated than that, it’s also not wholly inaccurate: like Twilight, Miki Falls is the story of a high school girl living in a small town, who meets a mysterious guy who turns out to be more than human—what’s more, he forms part of a secret community of similar not-quite-humans. They both fall in love with the other, but their relationship is not even slightly accepted by the boy’s community. At the very least, there’s lots of potential for audience crossover. 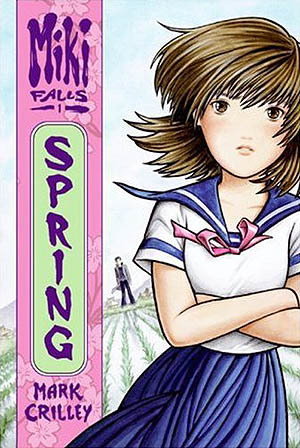 I first learned of Miki Falls rather accidentally: while browsing the manga isles at Borders (moment of sadness, please—its downfall means I can’t access most books anywhere but online, and It’s Just Not The Same), I stumbled across the creator’s name in the series’ first volume, which immediately got my attention, since Crilley was responsible for Akiko, a fantastic little series which can be most concisely described as The Wizard of Oz meets Star Wars, and which I heartily recommend to anyone with young children. Anyways, I decided to buy it. And then I bought the second volume and so on and so on. Twilight had not yet entered my personal consciousness. Based on what I’d heard and read about Twilight (I have not read the series, save for roughly the first half of the first book) I’d come to believe that Falls was Twilight done right, in that the characters were likable an root-for-able and that the work itself was not inherently problematic. However, the last few months—thank in no small part to Ana Mardoll’s fantastic Twilight deconstructions—have made me to see Falls rather differently. And it turns out that when seen in a critical light, Miki Falls is, in fact, rather problematic, and the fact that I didn’t see those problems before doesn’t speak very highly of the kind of person I was a year ago. So I’m writing these now—partly to compare and contrast the work with Twilight, partly to highlight its own particular ideas, and partly to exercise my critical writing skills. I can’t promise I’ll do it regularly, because I have a history of not keeping those, but the aim is to make one of these per week. The book is divided into four manga-sized volumes, one for each season of the year, which form the titles for each individual volume. Given that each book covers roughly three months of time in great detail, I’ll be discussing individual scenes, much in the style that Fred Clark first popularized among Slacktivites. While I intend to quote passages, I am not entirely sure to what extent I’ll be doing that, since I’m not sure how much would be considered fair use in a medium in which I could repeat all the words and only tell half the story. There will also be occasional pics, depending on what I can find online and how well scans work out. And all that’s left is the dancing.